1911 London General B-type petrol bus LA 9928, London Transport Museum, Covent Garden, Sun 1 April 2012. Introduced in 1910, the B-type was enormously successful. 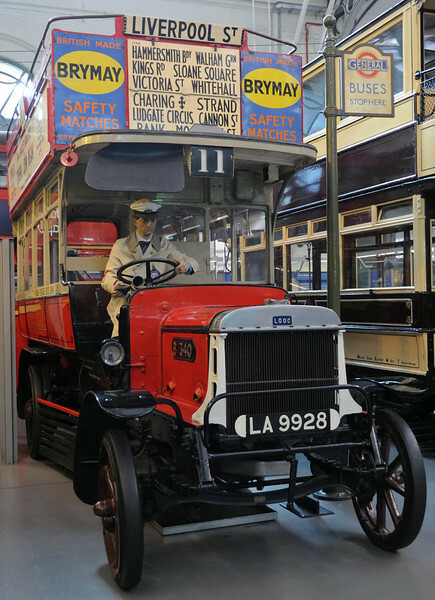 Some 2,500 were built in only three years, displacing all horse buses and most other motor buses in London. Many served with the British Army in France during the First World War. This one worked from 1911 to 1924. Bus route 11 has operated from Liverpool Street since 1906. It now runs to Fulham, passing many London landmarks - recommended for sight seeing!